Though his work is almost universally known within the English-speaking world, Charles Jennens is virtually unknown. He was a brilliant librettist -- a writer of texts to be put to music by others. Born in the year 1700, Jennens inherited his father's vast estate and wealth, attended Oxford University, and became a gentleman scholar. He published a controversial interpretation of William Shakespeare and lived a life of extravagance and eccentricity. That could have been the end of his story, but it was not. His emergence as a brilliant librettist was driven by a sense of theological and spiritual urgency. Jennens was greatly concerned to confront the deism that was then spreading so quickly among the educated classes in England in the wake of the Enlightenment. Deism rejected the self-revelation of God in the Bible, the need of humanity for salvation, the deity of Christ, Christianity's message of salvation, and any divine judgment to come. Deists rejected the very idea of a personal God who can be known, the intervention of God into human history, and all of the Bible's claims of miracles, prophecies, and divine promises. Jennens was determined to defend orthodox Christianity, and he was driven by two great impulses -- a sense of the threat to the spiritual health of the people by the encroachments of deism and a profound sense of personal grief over the death of his own younger brother, Robert, who, as a young student, had committed suicide after falling into a deep depression. Robert's depression was rooted in his having fallen into deep doubt about his Christian commitment, aided and abetted by correspondence with a professed deist. Jennens went to work on a great project he called "another Scripture collection." On the tenth of July 1741, he wrote a friend, stating: "Handel says he will do nothing next winter, but I hope I shall persuade him to set another Scripture collection I have made for him, and perform it for his own benefit in Passion Week. I hope he will lay out his whole genius and skill upon it, that the composition may excel all his former compositions, as the subject excels every other subject. The subject is Messiah." 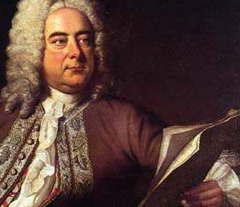 George Frideric Handel did agree to compose an oratorio based on Jennens' great "Scripture collection." He began composing on August 22, 1741 and completed the entire massive work in just twenty-four days of breathtaking intensity. Messiah was first performed in Dublin in 1742, and the work has been in continuous performance for over 250 years. Jennens understood the Bible to reveal a comprehensive and unitary story of God's salvation of his people. Messiah is arranged into three great parts. The first presents the promise of salvation and focuses upon the birth of Christ as the fulfillment of God's promise of a Messiah. The second part tells of the work of redemption and looks especially to the cross and resurrection of Christ. The third part looks to the final consummation of God's purpose of salvation in the future. Every word of the oratorio comes from the Bible and is based mainly in the King James Version. The power of Handel's majestic composition is evident in the fact that most of us cannot hear many of these biblical texts without hearing also the refrains of Handel's greatest oratorio. Where does this great work begin? How would one go about telling the story of God's redemptive work? Messiah begins with a text from Isaiah in the great recitative, "Comfort Ye," drawn from Isaiah 40:1-5. Comfort, comfort my people, says your God. Speak tenderly to Jerusalem, and cry to her that her warfare is ended, that her iniquity is pardoned, that she has received from the Lord's hand double for all her sins. A voice cries: "In the wilderness prepare the way of the Lord; make straight in the desert a highway for our God. Every valley shall be lifted up, and every mountain and hill be made low, the uneven ground shall become level, and the rough places a plain. And the glory of the Lord shall be revealed, and all flesh shall see it together, for the mouth of the Lord has spoken." Jennens began the story of our redemption with this prophecy of Isaiah, believing that it is ultimately fulfilled only in Christ. The message of comfort first addressed a future when Judah would suffer under Babylonian captivity, and was eventually fulfilled only in Christ, our Messiah, who rescued his people from captivity to sin and death. The promise of comfort is the promise of salvation, without which there can be no comfort. The good news is that in Christ our warfare is ended, our sins are pardoned, and the glory of the Lord is fully revealed. Just as the prophet was to speak tenderly to Jerusalem, God spoke tenderly to all humanity in Christ. The voice crying in the wilderness would eventually be known as John the Baptist, who did indeed call for the wilderness to be prepared for the coming of the Messianic King, and the way of the Lord was perfectly prepared. Like a causeway in the desert, in the fullness of time, God sent forth his Son. And all creation, from mountains to valleys and everything in between, became the great theater for the revelation of the glory of the Lord. All flesh -- indeed, the entire cosmos -- became one great witness to the revelation of the glory of the Lord. The people who dwell in darkness have indeed seen a great light. In Jesus Christ, the glory of God is revealed. And yet, how can we be assured of this great truth? On what basis do we make such a claim? How do we know that God has, in fact, made and kept the promise of our salvation? Isaiah declares the singular basis for our confidence in declaring this supreme truth -- "For the mouth of the Lord has spoken it." That one sentence grounds all our hopes -- "For the mouth of the Lord has spoken it." Our knowledge of the Gospel is not based in human speculation, but in the revealed Word of God. We have not come to know Jesus Christ as Savior and Lord by means of syllogisms or rational calculus. We did not come to know salvation by induction or deduction, but by revelation. We know the great good news of the Gospel because the mouth of the Lord has spoken it. The word of our Lord will stand forever. If so, we are saved. If not, we are doomed. This is exactly where all true Christian preaching and ministry begins. We begin with absolute confidence in God's promises precisely because we have absolute confidence in God's Word. Our confidence is full because we have heard God speak, and we receive and trust his Word in all of its dimensions. We live by the Holy Scriptures because we know that they are the written Word of God. We trust in Christ, the incarnate Word, who, from the beginning, was with God and is God. The Christian ministry is deadly serious business. The preacher stands to preach -- what will he say? People who dwell in deep darkness desperately need a great light. Souls soon to face the eternal judgment of God desperately need to hear the blast of a trumpet. Sinners utterly without hope desperately hold onto a hope for hope. What will the preacher offer? Flesh like grass, soon to wither and die, awaits a word. Fading flowers call out for rescue and an unfading hope. What is your message? This great text points us to the great comprehensive story of redemption that is our assignment as preachers of the Word and ministers of the Gospel. We know the only message that brings the promise of true comfort. We know that in the atonement accomplished by Jesus Christ, we find our only sure hope for the pardon of our iniquities. In the Gospel of Christ, we declare that our warfare is ended. Every single one of you is to be, in your own ministry, a voice that cries in the wilderness, "Prepare ye the way of the Lord." In the majestic glory of a faithful Gospel ministry, mountains are laid low, and valleys are raised up, even as rough places are made plain. Our great prayer for each of you and for all of you together is that the glory of God will be revealed in your ministry and in your lives so long as you may live -- in the churches you will serve, the sermons you will preach, the lessons you will teach, the lives you will influence, the mission fields you will reach, and the sinners who will come to know Christ as Savior and Lord through your witness. May you pour out your lives in service to the Gospel of Jesus Christ, the ministry of the Word, and the Church as the bride of Christ. Ground your ministry in the great story of God's redemption of sinners through the blood of our Lord Jesus Christ. Declare comfort to the people of God, and feed them faithfully by preaching and teaching God's Word. This is a commencement message preached Friday, December 10, 2010 by R. Albert Mohler, Jr., President of The Southern Baptist Theological Seminary in Louisville, Kentucky. Approximately 200 graduates will receive degrees during the ceremony, which will be available for viewing by means of streaming and archived video at www.sbts.edu. Calvin R. Stapert, Handel's Messiah: Comfort for God's People (Eerdmans, 2010). Richard Luckett, Handel's Messiah: A Celebration (Mariner Books, 1995). You can listen to my "Thinking in Public" conversation with Calvin Stapert here. The image above is a page from Handel's original manuscript of Messiah.